With Christmas and the New Year approaching it's the season of fireworks! Many dogs are afraid of fireworks and unfortunately, it can be so bad that a dog needs sedation in order to get through it. But it's not just fireworks that can cause our dogs anxiety. Just like us humans, dogs can find certain situations difficult, it may be crowded places, people, noises or even other dogs. 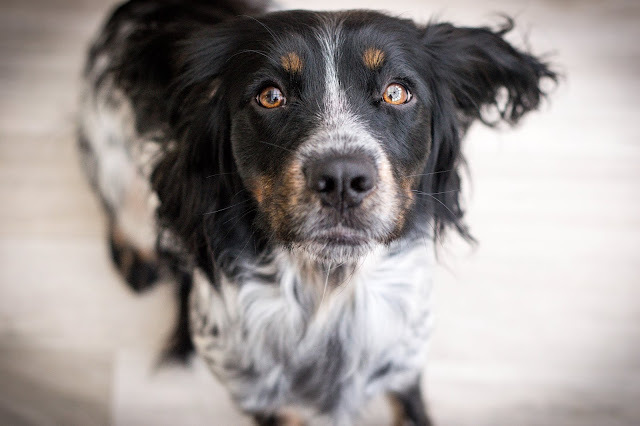 How do you treat dogs with anxiety? 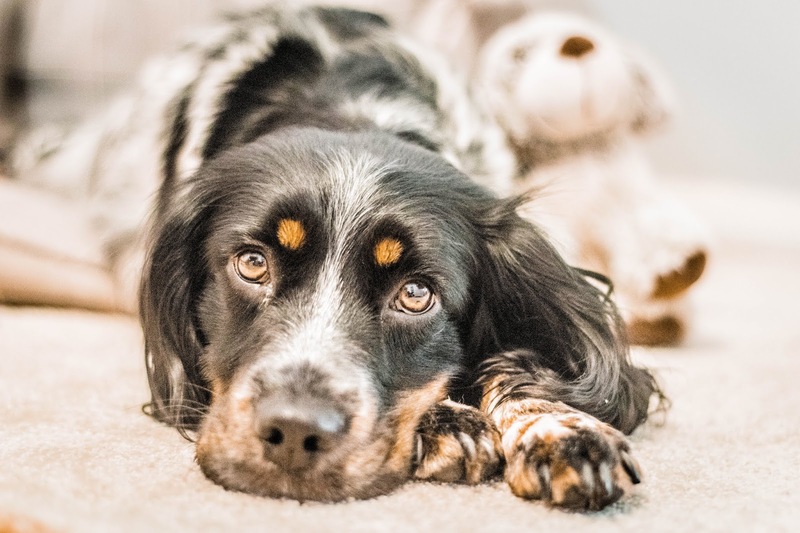 There are many ways to help a dog that suffers from anxiety from CBD (cognitive behavioural therapy) to weighted blankets, exercise, music, diffusers and even massage. With the puppies, I have been playing a firework desensitisation video on youtube which is on loop for an hour. So far all the puppies are happy and unphased by the noise. Even with the older dogs, I find that playing these desensitisation videos really helpful. 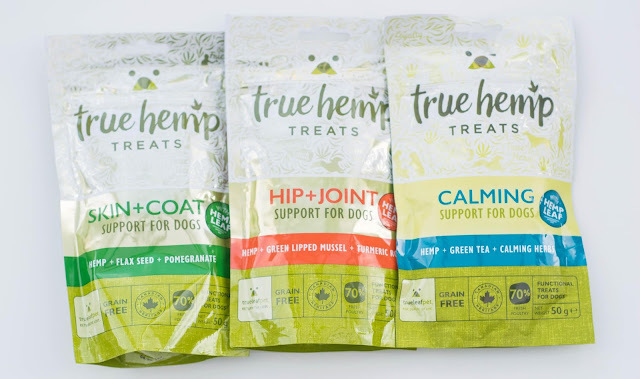 There are even treats to help calm dogs down, treats like Hemp calming sticks from True Leaf are said to help reduce tension in your dog. 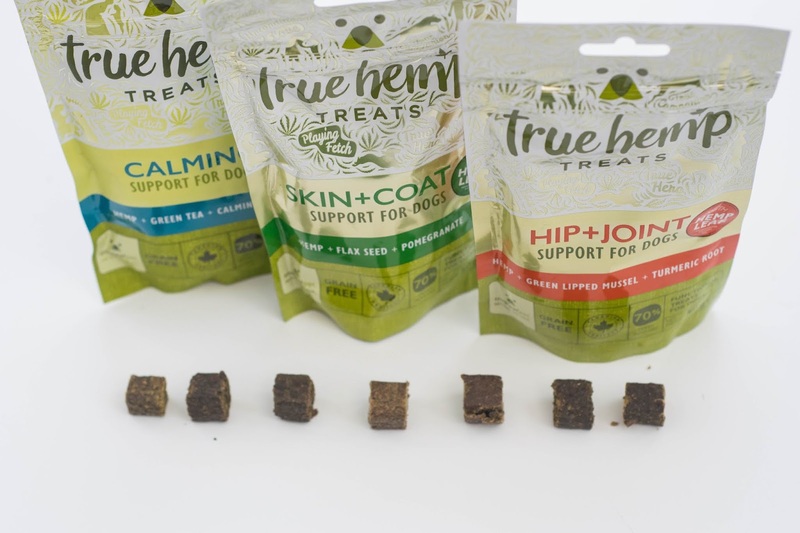 When I first heard about Hemp in dog treats I was a bit worried, my first thought was is my dog going to get high and is it safe? I think most pet owners will ask this question! 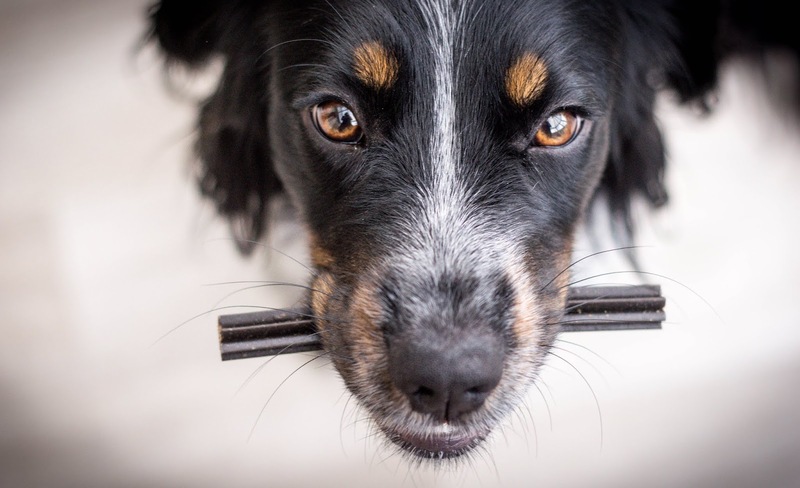 However, once I looked into the actual ingredients and realised that it's not going to get my dogs high as a kite I became interested in the health benefits that it could give my dogs. Cannabis is a family of plants with two primary classifications- Indica and Sativa. Hemp and Marijuana are not the same plants however they do come from the same classification which is Cannabis Sativa. This means that they do have similar properties but each have their own biological structure which gives them have several distinct differences. Marijuana contains high levels of THC which is the compound that induces psychoactive effects. Hemp contains 0.2% of THC but higher levels of CBD which has many health benefits. Hemp is used through many types of products from building materials to paper, milk, oils, clothes and food. Marijuana, on the other hand, contains up to 40% of THC which makes it illegal to use due to its psychoactive effects. Recently we were sent a selection of products from the True Leaf Pet company. 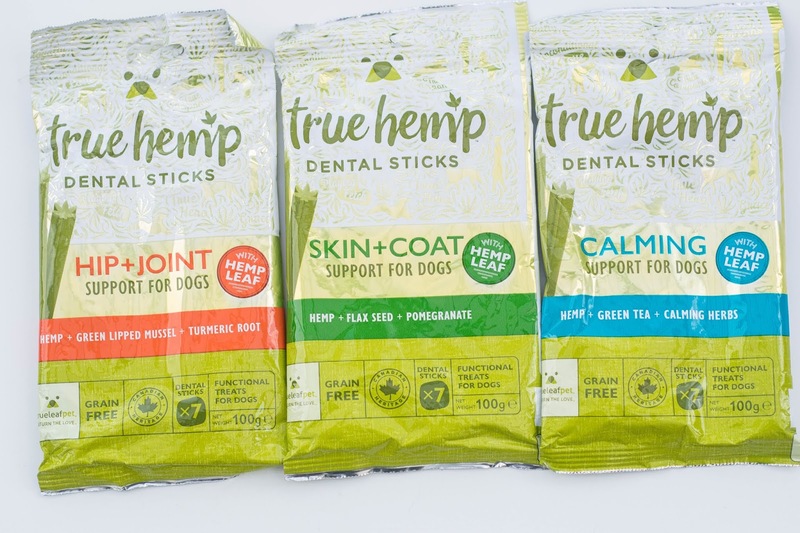 Our parcel contained a selection of hemp calming sticks and bites as well as Hip + Joint and Skin + Coat treats. With firework night coming up I was intrigued to see if the calming sticks would be useful for our 9-year-old Chihuahua Daisy who is absolutely terrified of them. She is so bad she vibrates instead of walks and spends hours hiding and crying. Anything would be worth a try to help settle her. Honey, on the other hand, isn't too fussed. 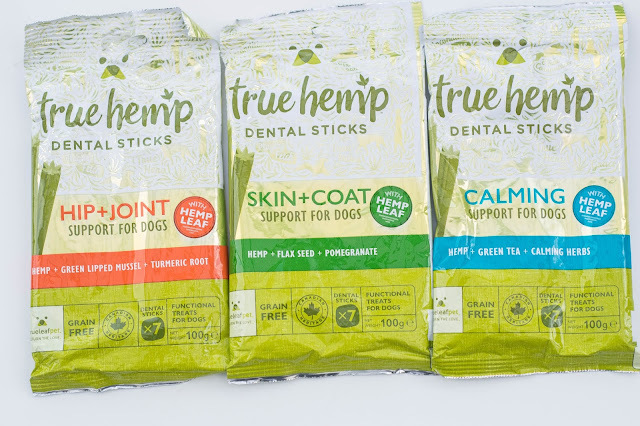 The True Hemp Dental Sticks contains several calming properties the first being Green tea. Green tea contains L-Theanine an amino acid with a soothing /calming effect to help reduce anxiety levels. 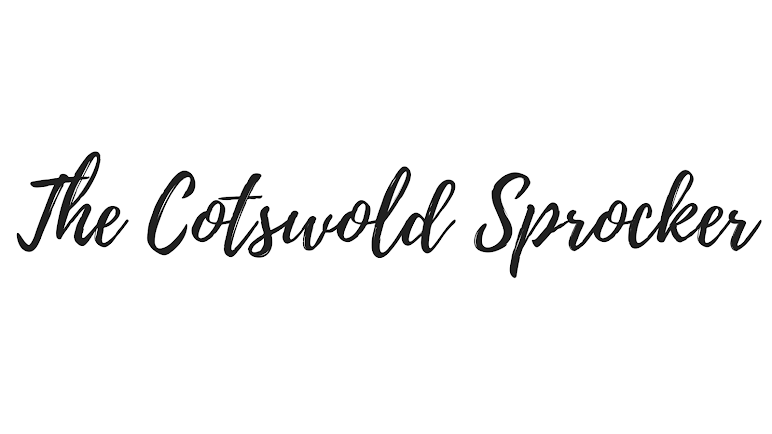 Naturally, calming herbs such as chamomile and lemon balm are also present in the ingredients as well as hemp leaf and ground hemp seeds which contain Omega 3 and Omega 6 which is known for its help with lowering anxiety. Folic acid for healthy blood cells. Thiamine for a healthy heart, muscle and nervous system. Stearidonic acid - plant-based source for Omega 3 fatty acids. Vitamin B for a stronger immune system. Riboflavin - For good eyesight and skin. I decided to give both girls a dental stick a few hours before the local fireworks display. Both had no issues in eating the treat miss fuss pot Daisy wolfed hers down. I was pleasantly surprised by the True Leaf Calming Dental Sticks, the first night Daisy was stressed but showed an improvement, on the second day of the fireworks she was able to lie on the sofa relaxed, and asleep whereas normally she would be running all over the house trying to to find somewhere safe. The dogs showed no psychoactive effects. I highly recommend picking some of these up, over the next few weeks I will be getting the girls to try out some other treats to see what they are like. In all, I have been very surprised and pleased by the results rating the hemp Calming sticks. I will be making sure we have some in stock for the new year as we always have lots of firework celebrations around us.